We're all done! Thanks everyone for a great semester! For the first month of the spring semester, Jeff will hold office hours specifically for Fall 2016 CS/ECE 374 students who want to see their final exams. Details will be announced on Jeff's web page (and here if possible). Final exam scores are available on Moodle; the following table shows the grade distribution. The overall mean and standard deviation and the resulting letter-grade cutoffs exclude outliers above 90% and below 25%; statistics for individual problems do not exclude outliers. All homework, lab, and exam solutions have been removed from the web site. All homework submissions been graded, and grades are available on Gradescope. You may bring two 8½"×11" sheets of paper, with anything you like written, drawn, printed, photocopied, or engraved on both sides. Otherwise, the exam is closeD–everything; in particular, only medically necessary electronic devices are allowed at the exam. Leave your cell phones turned off in your backpacks. We will provide answer booklets; you should bring only writing implements, your “cheat sheet”, and your brain. A large collection of study problems on NP-hardness and undecidability is available. The final exam will also cover material from earlier in the semester; please see the practice problems for Midterm 1 and Midterm 2. Jeff's office hours this afternoon and next Wednesday are 3pm-4pm, instead of 4pm-5pm. Jeff will also be available this afternoon from 5 to 5:30. Sorry for the late notice! Homework 11 solutions are available. The final exam will be held Thursday, December 15, 7-10pm. Locations and room assignments will be announced soon. The exam will cover the entire course, from string induction to undecidability. Tomorrow's class will include a course overview, as a preliminary review for the final exam. However, we will probably not have time to work through potential exam problems. We will post a list of study problems for the last chunk of the class (NP-hardness and undecidability) soon. Labs will meet as usual this Wednesday; these will also be review sessions for the final exam. There will be a conflict final exam, hopefully either December 12 or December 13. If you need to take the conflict final, please fill out this form no later than Friday, December 9. The date and time of the conflict final will depend on the exam schedules of the students who require it. We will have a final review session Saturday, December 10, 2-4pm, in 1002 ECEB (the usual lecture room). The conflict exam will be after the review session. Office hours will continue as usual through December 15, although there will be some time adjustments to accommodate the TA's final exams and other conflicts. Here is the distribution of scores from Midterm 2. The letter-grade cutoffs were computed after excluding outliers above 95% and below 25%. Here is the distribution of combined midterm scores, counting all ten problems. Again, letter-grade cutoffs were computed after excluding outliers above 95% and below 25%. Please remember that these are still very crude estimates of your overall course grades, based on only 40% of your graded work. Past experience suggests that most students’ final course grade will be within one letter grade of this estimate, but larger differences (in both directions) are still fairly common. 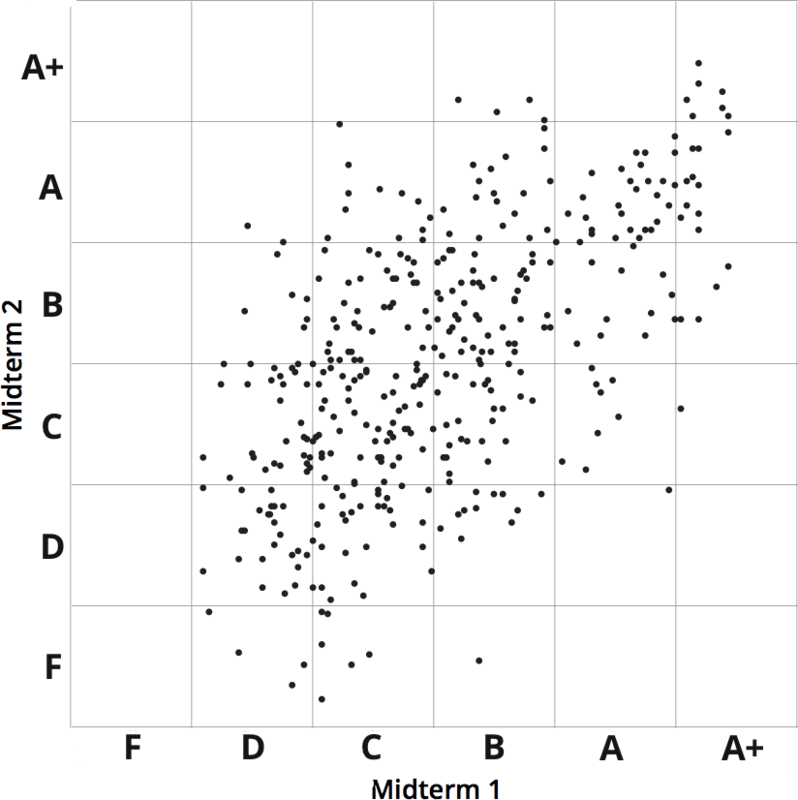 Finally, here is a scatter plot showing the surprisingly weak correllation between Midterm 1 and Midterm 2 scores. For both exams, scores have been normalized to the number of standard deviations above or below the mean, or equivalently, the number of letter grades above or below the B–/C+ boundary. (I recomputed the letter-grade cutoffs after excluding outliers in the sum-of-midterms distribution.) Notice that several students’ midterm scores differ by more than two full letter grades, in both directions. Midterm 2 has been graded; all grades are available on Moodle. Your exam will be returned today (Wednesday) and Friday in the lab section you indicated on the cover page of the answer booklet. If you miss lab tomorrow (or you did not indicate a discussion section), you can pick up your exam during any office hour in Siebel. Please double-check that we have recorded your exam scores correctly. Here are some preliminary statitics; we will post a more detailed score distribution later. Homework 11 is “due” Tuesday, December 6. This homework is only for practice; you will not actually submit anything. However, questions on this material may appear on the final exam, so we still strongly recommend treating this as a regular homework. We will release solutions next week as usual. We will distribute ICES forms in lecture this Thursday and in labs this Friday. Please come to at least the last 15 minutes of Thursday's lecture and your regular Friday lab section to fill out the forms, even if you do not regularly attend class/lab, and even if you have already dropped the class. These forms are your opportunity to offer official feedback on the course, the instructors, and the teaching assistants. Your feedback is extremely important to us and to the department, especially because this course is still relatively new. Homework 9 solutions have been updated. As many people pointed out, the reductions in problem 2 were reversed in the original posted solutions. Following course policy, everyone will get a perfect score for HW9.2 as extra credit. Hanny Thanksgiving! Homework 10 is due Tuesday, November 29, after Thanksgiving break. I strongly recommend starting this week. Jeff didn't read the room reservation carefully. If you were schedeld to take Midterm 2 in Loomis, please go to 100 MSEB instead. To compensate for the extra confusion exam will start at 7:30 in that room. Homework 9 is due next Tuesday, November 15. Homework 6 grades and Homework 7 grades are now available on Gradescope. Homework 8 solutions are available. Midterm 2 will be held next Monday, November 6, from 7pm to 9pm. The exam covers all material covered in Homeworks 4 through 8: Recursion, divide-anD–conquer, backtracking, dynamic programming, greedy algorithms, graph representations, graph traversal, topological sort, strongly connected components, and shortest paths. Please go to the following rooms, according to the first few letters of your last name. Everyone is in a different room than they were for Midterm 1. You may bring one 8½"×11" sheet of paper, with anything you like written, drawn, printed, photocopied, or engraved on both sides. (Please, just one sheet of paper, not two stapled together.) Otherwise, the exam is closeD–everything; in particular, only medically necessary electronic devices are allowed at the exam. Leave your cell phones turned off in your backpacks. We will provide answer booklets; you should bring only writing implements, your “cheat sheet”, and your brain. The conflict exam will be offered on Tuesday, November 8. If you need to take the conflict exam, please register no later than Friday, November 4. A large collection of study problems is available. This should give you a good approximation of the types of questions that we will ask on the exam. Solving every problem in this collection is not the best way to study for the exam. Memorizing the solutions to every problem in this handout is the worst possible way to study for this exam. See the first page of the handout for advice on how to use these problems to study. There is no lecture this Thursday, and there are no labs this Friday. Instead, we will hold optional review sessions at the regular lecture and lab times. Please bring questions. In particular, please feel free to ask questions from the list of study problems. Homework 5 grades are now available on Gradescope. Homework 4 grades are (finally) available on Gradescope. Tana's Friday office hours are permanently moved to 5–6pm, 30 minutes earlier than before. Homework 8 is due Tuesday, November 1, at 8pm. This is the last homework before Midterm 2. We have posted a short survey asking which class resources you find most/least useful and to collect other feedback about the course. All survey responses are anonymous. Please let us know what you think! Homework 7 is due Tuesday, October 25, at 8pm. Starting this week, Jeff has additional office hours every Wednesday 4-5, in the open area outside his office in Siebel. Here is the distribution of scores from Midterm 1, excluding question 2. The letter-grade cutoffs were computed after excluding outliers above 95% and below 25%. However, letter grades for those outliers were computed using the resulting curve. More than half the class scored a zero on problem 2, which means it was a bad exam question. To compensate for our blunder, we plan to compute letter grades at the end of the semester roughly as follows. First we will compute everyone's letter grade normally, including all exam problems. Then we will compute everyone's letter grade again from scratch as though problem 2 did not exist, using a completely independent curve. (We reserve the right to modify the alternate grading algorithm.) Finally, each student will receive the higher of the two resulting letter grades. For most students, excluding problem 2 gives a higher grade, which is why we've excluded problem 2 from the scores below. Please keep in mind that these letter grades are extremely rough predictions of your final course grade, based on only 20% of your overall coursework. Past experience suggests that most students‘ final course grades will be within one letter grade of these estimates, but differences of up to a full letter grade (in either direction) are fairly common, and differences of up to two letter grades (in either direction) are still possible. In particular, if you got a high score on problem 2, your estimate could as much as a full letter grade low. Homework 6 is due Tuesday, October 18, at 8pm. Midterm 1 has been graded; all grades are available on Moodle. Your exam will be returned tomorrow (Wednesday) in the lab section you indicated on the cover page of the answer booklet. If you miss lab tomorrow (or you did not indicate a discussion section), you can pick up your exam during any office hour in Siebel. Please double-check that we have recorded your exam scores correctly. Here are some preliminary statitics; we will post a more detailed score distribution tomorrow. Homework 3 grades have been available on Gradescope for some time. The original solution we provided for the solved problem in Homework 4 contained serious errors; the solution has since been fixed. In accordance with course policy, all students will receive a perfect score for that problem as extra credit. Happy Leif Erikson Day! We have made a subtle clarification in the homework policies: Homework solutions do not require complete proofs of correctness unless we explicitly ask for them. However, you must provide enough justification to convince us that you understand why your solution is correct. For example: When you describe a DFA or NFA, you must explain the purpose of each state; when you describe a context-free grammar, you must describe the language of every non-terminal; if your running time comes from solving a recurrence, you must at least state the recurrence; if the algorithm includes a “magic” step, you must explain why that step is correct. In particular, “I found this algorithm on Wikipedia” is not sufficient justification. Homework 5 is due Tuesday, October 11, at 8pm. Solutions and tentative rubrics for Midterm 1 are available. Homework 4 is due Tuesday, October 4, at 8pm. Homework 2 grades are now available on Gradescope. All conflict exams for Midterm 1 have now been scheduled. If you registered for a conflict exam and have not received email telling you when and where your conflict exam will be held, please send Jeff email as soon as possible. Homework 1 grades are now available on Gradescope. We noticed several Homework 1 submissions where the person who submitted the homework did not also submit their other group members’ names. If you did not submit your group’s homework, please double-check that you actually received a grade, and if you didn’t ask the person who submitted the homework to updat the group list. (Yes, you can still do this now.) It is your responsibility to make sure the person who submits your group’s homework also submits your name. We cannot give you credit if your name is not attached to your work. Midterm 1 will be held next Monday, September 26, from 7pm to 9pm. The exam covers all material covered in Homeworks 0, 1, 2, and 3: Induction, regular languages, regular expressions, DFAs, NFAs, product and subset constructions, fooling sets, regular language transformations, and context-free grammars. In addition, there may be a small number of True/False questions about Turing machines. The conflict exam will be offered on Tuesday, September 27. If you need to take the conflict exam, please register no later than Thursday, September 22. A large collection of study problems is available. This should give you a good approximation of the types of questions that we will ask on the exam—in particular, there will be a series of True/False questions—but the actual exam questions may or may not appear in the handout. In past semesters, students collaborated on a shared Google Doc with solutions. Earlier today, Jeff requested registration overrides for ALL remaining students on the waiting list who submitted HW0, HW1, and HW2. A few students on the waiting list did not submit HW1 and/or HW2; those students were removed from the waiting list. If you believe you are still on the waiting list and you do not receive email from Jeff today, please let us know as soon as possible! You must submit your regrade requests on Gradescope. No grades will be changed during face-to-face discussions with students. Regrade requests must be submitted by September 28. Late regrade requests will be ignored. You must submit a brief written justification for the regrade request. Regrade requests with no justification will be denied. We can only regrade your original submission. Explanations, clarifications, and corrections will be ignored. A regrade request is a request to regrade your problem from scratch. Your grade may go down. Homework 3 is due next Tuesday, September 20, at 8pm. This is the last homework before Midterm 1. Homework 2 is due next Tuesday, September 13, at 8pm. We have requested the first round of registration overrides from the waiting list. Several people have been now removed from the waitlist, either because they did not have credit for CS 173/Math 173, they did not have credit for CS 225, or (as far as we can tell) they did not submit Homework 0. Unless you have email from Jeff telling you otherwise, you are still on the waiting list. Everyone please edit your Gradescope account so that the "Student ID" field is empty. University ID numbers are sensitive information that can (in principle) be used to access student records and should therefore be used only on secure internal university web servers. Do not give them to Gradescope. Apparently squirrels* got into the projector cables in ECEB 1002, so Alexandra had to lecture at the blackboard. Unfortunately, the lecture video does not pick up the board work, but it does include the audio, and lectures slides are still available. *No, not really. It was actually aliens. Office hours this afternoon will be held in 3405 Siebel. But only this afternoon; we are still looking for a regular room. Homework 1 is due next Tuesday, September 6, at 8pm. For this and all future homeworks, groups of up to three people can submit joint solutions. You are responsible for forming your own homework groups; we recommend using Piazza to search for teammates. Although we don't recommend it, you can submit with a different group for each homework, or even for each numbered homework problem. Submission mechanics: For each problem, one person in each group submits the solution PDF file to Gradescope and tells Gradescope who else is in their group. In addition, the beginning of each homework submission should clearly state the Gradescope name and email address of each group member. You may find Automata Tutor helpful as a warmup for designing regular expressions, DFAs, and NFAs. There are several updates to the office hour schedule. In particular, Monday's office hours are in 3300G Siebel, not Ceramics. We are looking for an actual room for office hours, so we don't overcrowd the hallway. Submission pages for HW0 are available on Gradescope. Submission closes automatically at 8pm on Tuesday. You can resubmit as many times as you like, so submit early! In particular, you may want to submit a fake PDF today just to see how the system works. A LaTeX homework template is finally available. We strongly encourage you to use this template to typeset your homework submissions. Solutions to last Wednesday's and Friday's labs are available. Future lab solutions will appear unannounced on the schedule page. Until further notice, there will be no more Moodle quizzes. Class registration and the waiting list are now both closed. There are 127 students on the final waiting list. (This number excludes duplicates, students who successfully registered after adding their name, and students who do not satisfy the prerequisite requirements.) We expect to send out the first registration overrides next Wednesday, after Homework 0 is due. Starting today, all lectures will be recorded. Unfortunately, there is no video for Tuesday's lecture, because Jeff requested the recording too late. (Sorry!) However, slides from Tuesday's lecture are available; slides from all future lectures will also be posted on the schedule page. You are welcome to enroll on our Gradescope site using any name and email address you like. However, to give you credit for your homework submissions, we need to know who you are. Unless you are using both your real name and your illinois.edu email address on Gradescope, please fill out this form to register your Gradescope identity. Also, if you are not using your real name and illinois.edu email address on Gradescope, do not include your real name and NetID in your homework submissions—use your gradescope name and email instead. Never ever ever give your UIN to Gradescope. Ever. There are no office hours today. Regular Monday office hours start next week. Homework 0 is due Tuesday, August 30 at 8pm. We will provide a LaTeX solution template soon; watch this space. Lab handouts and updated lecture notes for the first week are available. Feel free to get started early! All homework will be submitted and graded electronically via Gradescope. Please enroll yourself on our Gradescope page as soon as possible, using the access code 9V6WG9. You are not required to sign up using your illinois.edu email address or even your real name; you may use any email address and alias you like. You are also not required to be registered for the class (or even a student at Illinois) before you sign up; please also enroll yourself if you are on the waiting list. To give you credit for the homework, we need to know who Gradescope thinks you are. There will be a web form to tell us your Gradescope identity soon; watch this space. The class is full! Information about our waiting list is available. If you are a graduate student: You should take CS 473. All labs meet every Wednesday and Friday. Homeworks are released at least one week before the due date. Under normal circumstances, graded homeworks should be returned within two weeks of submission. Si maintenant vous me donnez une équation que vous aurez choisie à votre gré, et que vous desirez connaître si elle est ou non soluble par radicaux, je n’aurai rien à y faire que de vous indiquer le moyen de répondre à votre question, sans vouloir charger ni moi ni personne de la faire. En un mot les calculs sont impracticables.